Taylor Petrey, a professor of Religion at Kalamazoo College in Michigan, has a very well-argued piece at Patheos about how we ought to be discussing religion these days, and how we’re not. 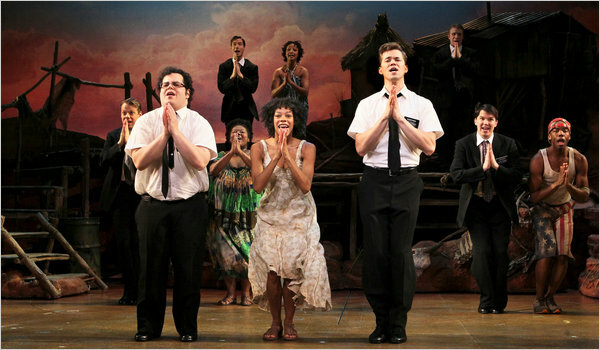 Petrey summarizes the great bulk of discussion of Mormon beliefs over the last few years (including in the Book of Mormon Musical, pictured at left), which has a strong focus on exotic beliefs, like the location of the Garden of Eden, and the relationship of Jesus and Satan. This discussion brings at least two problematic results. The first is the defensive response that, well, all religions have strange beliefs. Second is the sometimes patronizing corollary– “well, they’re nice people (despite believing really weird things).” While these responses are true and relevant, they unfortunately accept the frame in which the discussion has been set– that religion is weird. Once accepted, that premise justifies a person in presuming that there is nothing there besides daft dogma and saccharine sweetness. The questions that we should be asking, and Mormons should be answering: How does Mormonism handle the big questions? What is the meaning of life, of death, of the terrible and the good in the world? How do Mormon notions about the cosmos affect ethical decisions toward others? What do Mormon narratives about the past and the present offer their adherents? These are not simple questions, and the answers are not simple either. To discuss them at all is a serious endeavor. While we may laugh (and I think we should) about religion, we can only do so ethically if we learn to think with religion as well. In Petrey’s telling, it is fundamentally misleading to act as if religious belief is an exotic kind of human experience, rather than an ordinary human experience. We all wonder how we should live, how to be happy, how to be good, how it will all end for us. It is the exact opposite of exotic to adopt beliefs that bring peace and resolution to such inquiries. Thus, no understanding will follow from highlighting the weirdest oddities. For me, and I imagine, for millions of other believers like me, the view of religion as ordinary, natural experience rings very true. Yes, I do believe those things that sound strange to outsiders. But the reason I do is because those peripheral ideas are woven into a much larger fabric of belief that reaches to the foundations of why I am here and what my life should be. If modern, secular commentators want to toy with those out-hanging threads, they should at least consider tracing them back to the web at the heart of the belief. American commentary on Mormonism has improved in many areas over the last five years. But thus far, on the specific measure of exploring a fully dimensional view of what Mormon belief really means, advancements have been few. I applaud your purpose — and hope that you will take on some of the idiocy that’s been flung out by conservatives as well as liberals about Mormonism. I worry that given the timing of this blog, it will wind up mostly being about inaccuracies from the left. As a faithful Mormon who supports Obama (yes, there are some of us out there), it’s my belief that there’s just as much in mainstream American conservatism that conflicts with gospel principles as there is in mainstream American liberalism. It’s also been my experience that conversative Christians are just as likely as liberal atheists to distort Mormon history and beliefs. Very well said, as well as your other posts on this site. Keep up the good work. Totally agree. I have noticed comments mostly directed at the far letters who are misinformed and causing problems but I have just as Mich problem with the far righters and their potential to harm our nation and what it stands for..and our religion for that matter. I think this lack of empathy and understanding goes both ways. There are people who are not LDS, and make no effort to understand out religious beliefs, and there are people who are LDS who go out of their way not to learn about the basic beliefs of other religions. So, when I wanted to go to vacation bible school at the baptist church close to my school, my mom signed the papers to enroll me, 4 years in a row. When Tina took her first communion classes I went along with her, much to the surprise of the priest. My explanation that I wanted to understand was accepted, and I watched as my new friends from that class received their first communion. By the time I wanted to take Bat Mitzvah classes with Wendy, no one batted an eye. Out families had been celebrating Passover together for a couple of years and continued to do do until they moved. I was terrible at Hebrew pronunciations, but I learned a lot of Jewish history and culture. It helped me understand my own Jewish ancestors and the religion and rituals that sustained their faith. A fairly large group of us fasted during Ramadan in solidarity with Anwar, and since I fasted two meals once a month anyway, a month of really only fasting one meal, lunch, wasn’t hard to do to help a friend who was struggling with the demands of his faith and his desire to fit in as a fourth grader. It just seemed right. We got permission to go to the library do we weren’t tempted in the lunch room and we found out that the basic stories of the Koran, Torah and Old Testament were similar enough to play “Story Charades” with Old Testament stories, at recess, long after Ramadan was over. All of this religious exposure did not lessen my faith. In many ways it was the strength of my early experiences that then allowed me to stick with my LDS faith during times of trial and doubt. It also allows me to move deftly, for the most part, through a variety of religious communities. I love going to Midnight Mass if I am close enough to a Catholic church that has one. I have a friend I go with to at least one of the High Holy Days each year. I also can talk about my religious beliefs in language that my friends of different faiths can relate to, and sometimes translate words or situations that were confusing when they interacted with one of my LDS brothers or sisters.